What’s that I hear? Crunching leaves. What’s that I smell? Apple pie. I’m kicking off 15 fabulous fall home tours (3 per day every day this week) so sit back, relax with a coffee (or spiked cider) and enjoy. 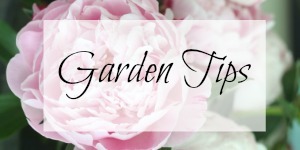 It’s my usual mix of old and new with some fun new things thrown in for good measure. 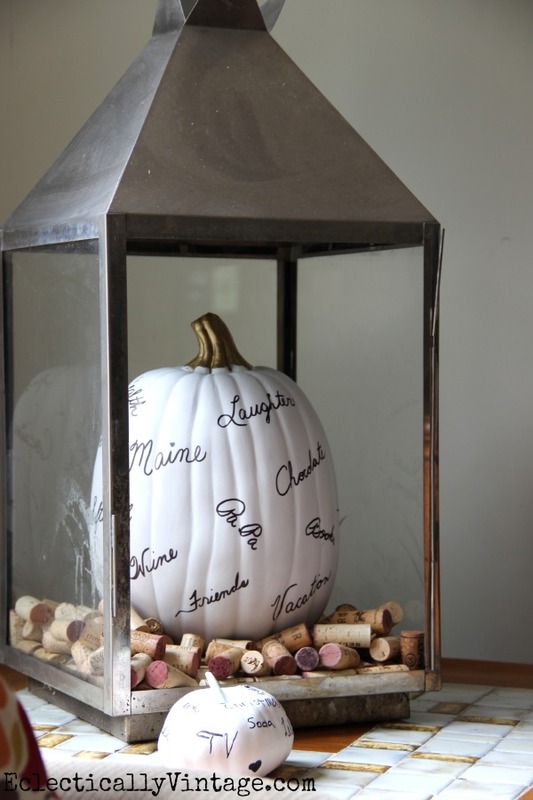 It’s fun to spell out your favorite words on some pumpkins and don’t overlook the lowly popcorn kernel when decorating. or at least where the turkey gets it’s goose cooked. the candy jar will be empty within weeks (don’t judge me). 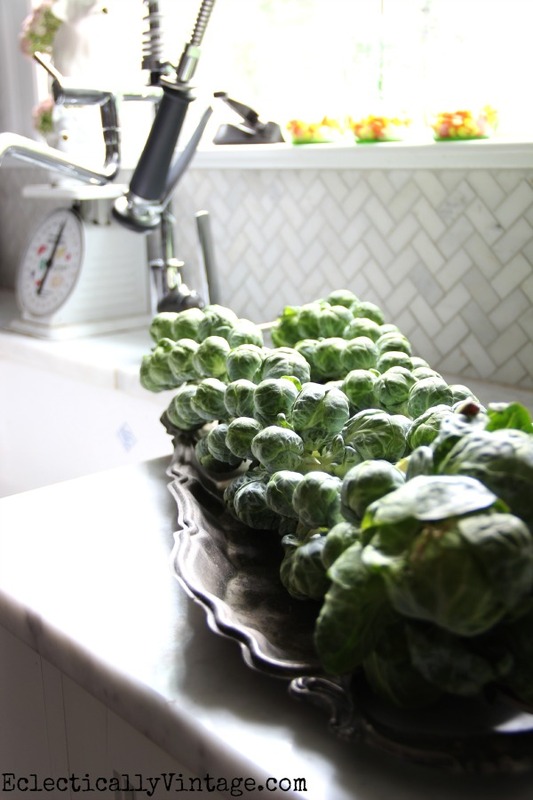 I love brussels sprouts, especially the ones that come on these long stalks – perfect for setting out on your counter before you turn them into a tasty side dish. 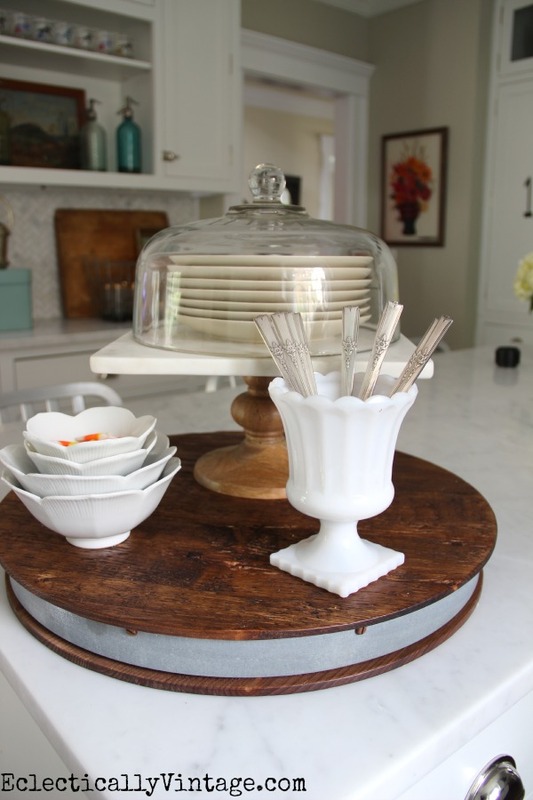 One of my favorite finds is this marble cake stand. 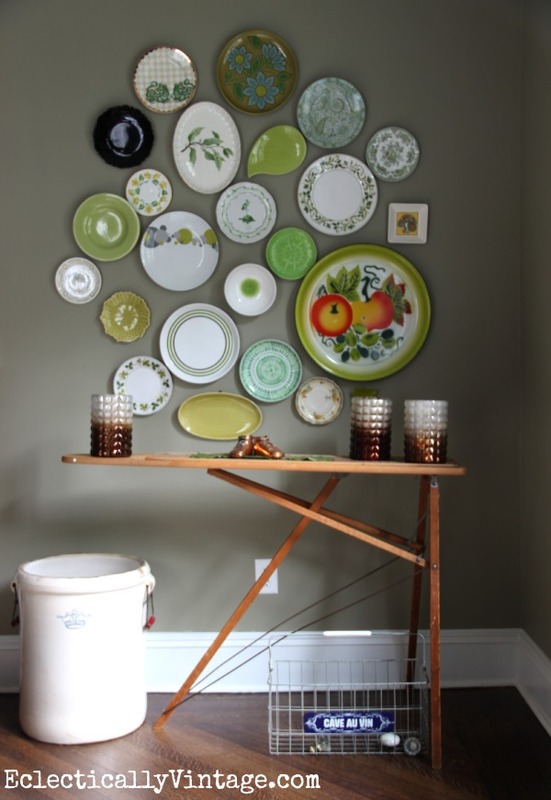 I love the square shape – perfect for displaying a favorite plate collection (and less calories). 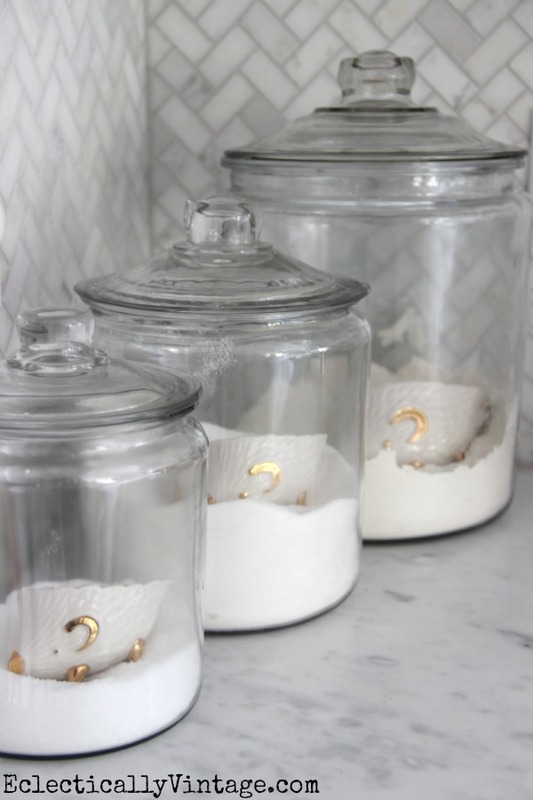 I love these glass jars that come in different sizes – perfect for countertop storage with cute measuring cup scoops. Ta da! I found this vintage blue medical cabinet at an estate sale a couple of months ago. Anyone remember the Charles Chips man delivering these tasty morsels? 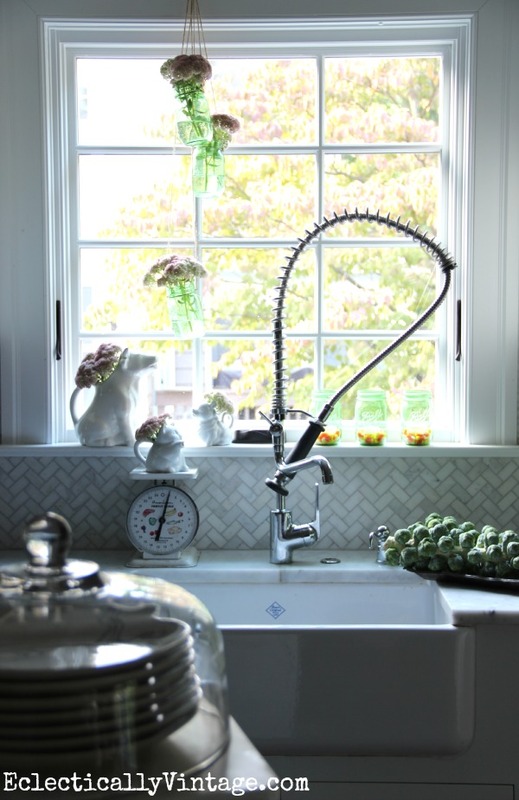 I love mixing unexpected things like vintage landscapes into my kitchen. Cheers! Love these monogram mugs but who needs coffee when they can hold colorful vintage lightbulbs instead. 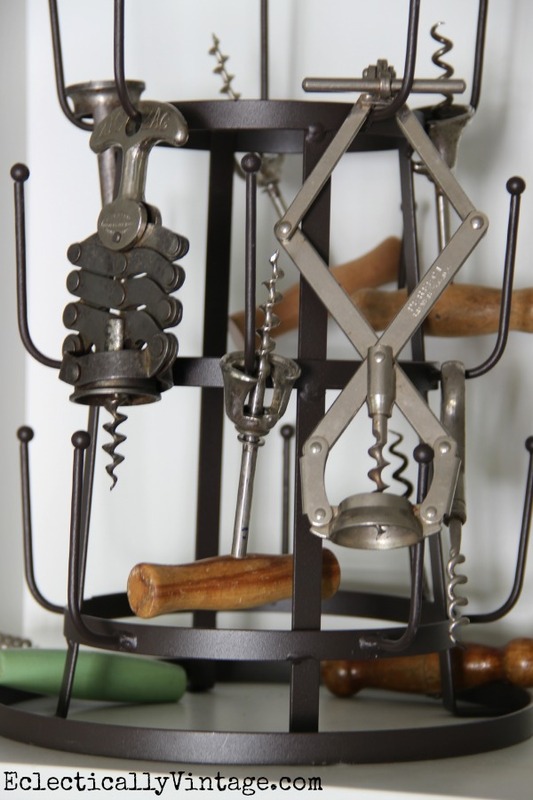 I’ve always wanted a vintage bottle drying rack and this mini version from World Market is perfect for my vintage corkscrew collection. My vintage squirrel nutcracker is a thrift store find. I can neglect these faux succulents all I want. 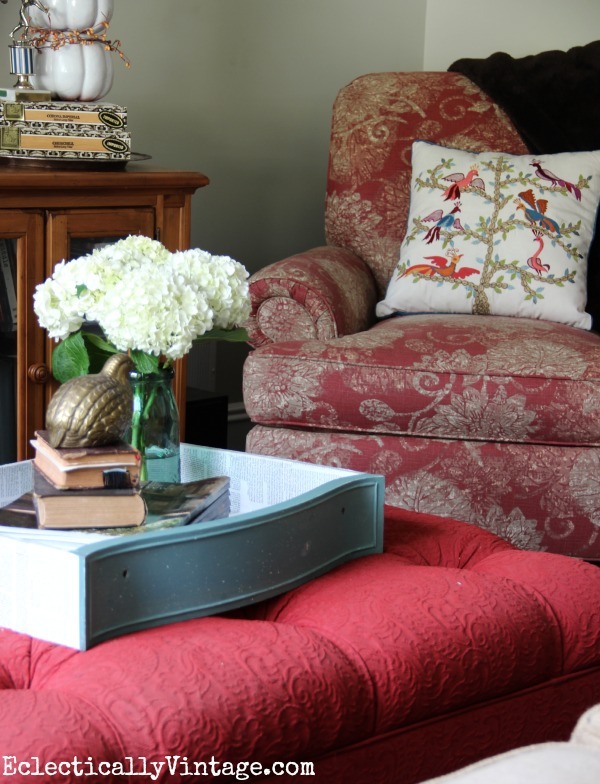 Pillows are one of the easiest way to get some seasonal color into a room. 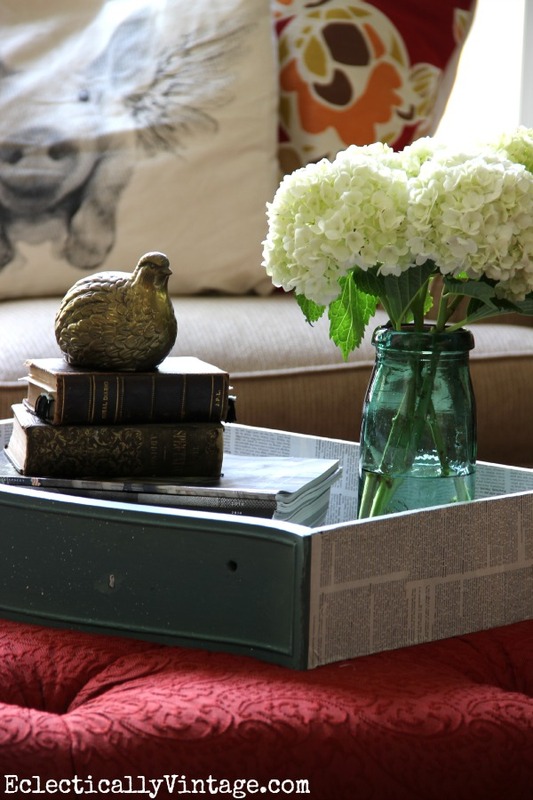 I turned an old drawer into a fun little tray for my ottoman. Our Thankful Pumpkin from last year gets a spot of honor – we’ll make more this Thanksgiving. 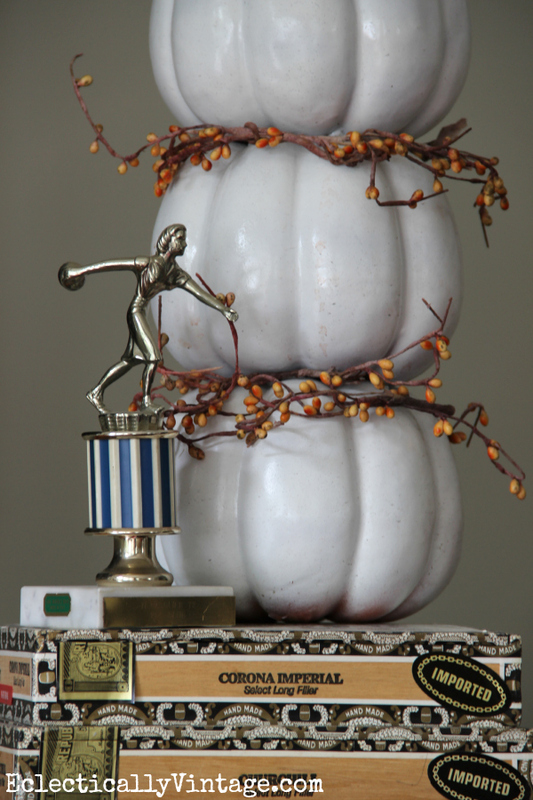 My pumpkin topiary decided to come inside this year and got a trophy for her effort. 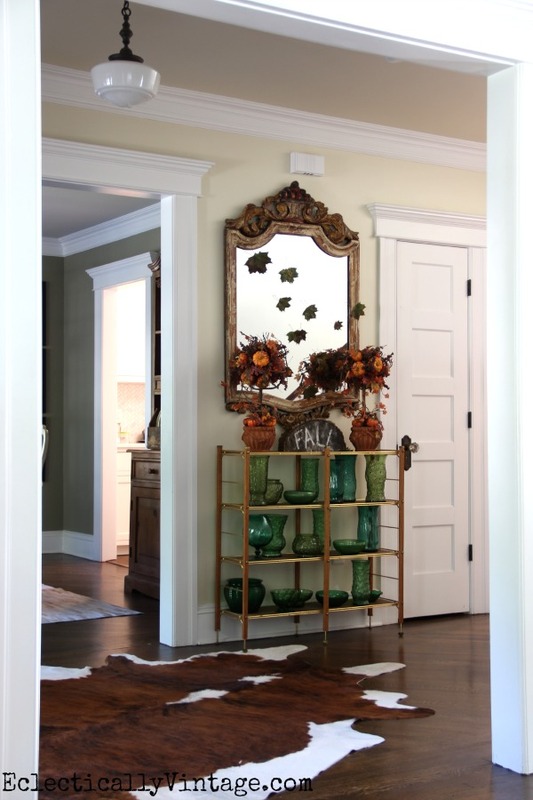 My foyer is even falling for fall. 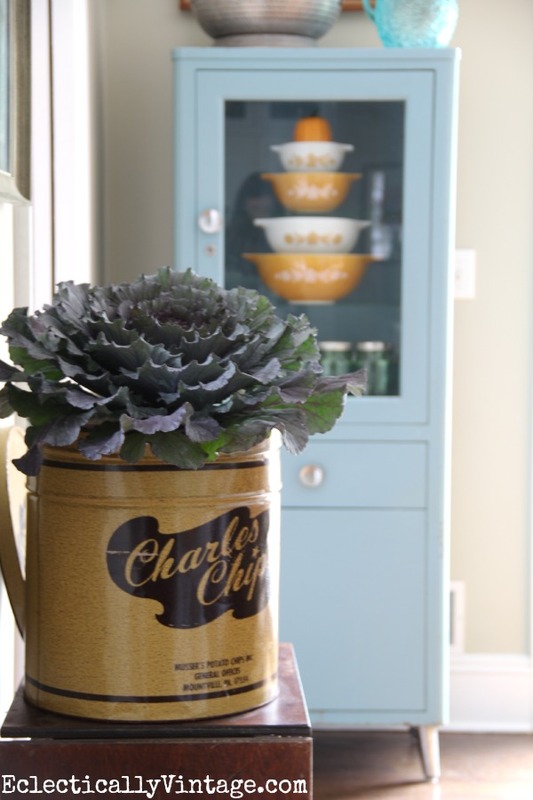 See how to preserve leaves to keep them looking beautiful all year long. 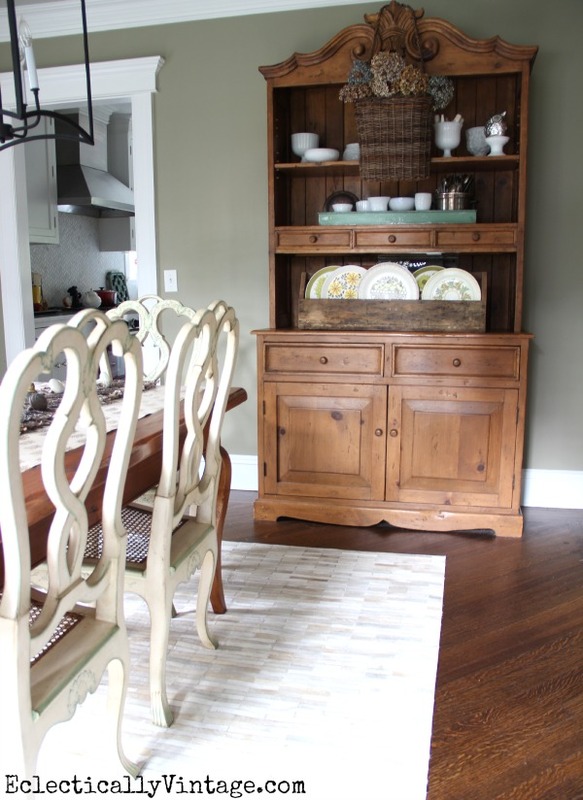 Turkey time calls for a warm and welcoming dining room (and lots and lots of wine). 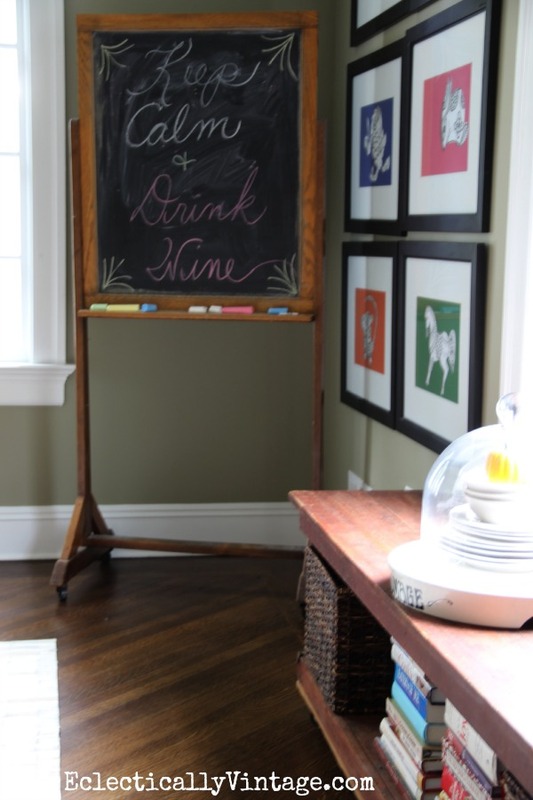 An old ironing board will do double duty as a buffet – pass the giblets please. 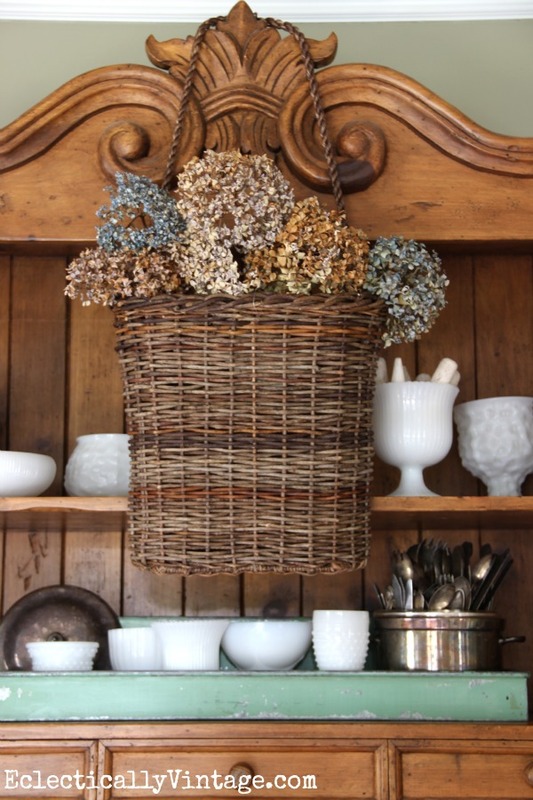 I love the texture of the hanging basket – perfect for showing off dried hydrangeas. 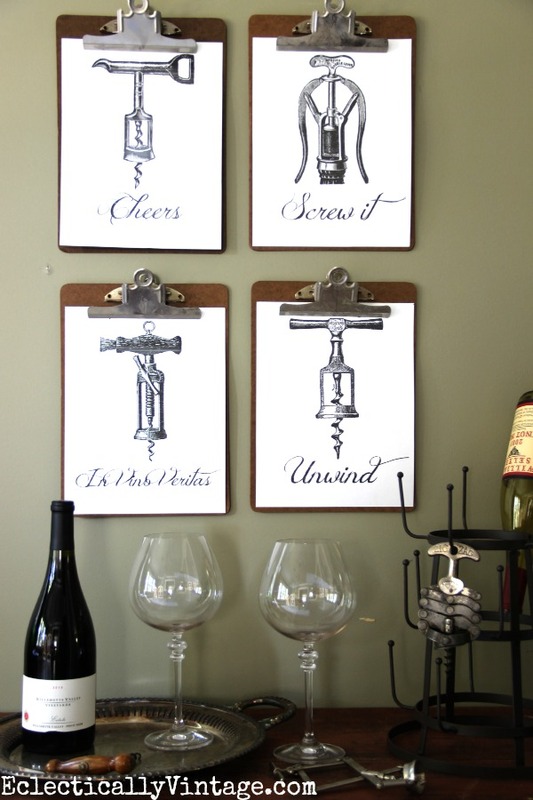 Fall is all about good friends and good wine so I created these vintage corkscrew free printables. To make the coconut table runner stand out again my dark table, I layered a little blinged out wrapping paper underneath. 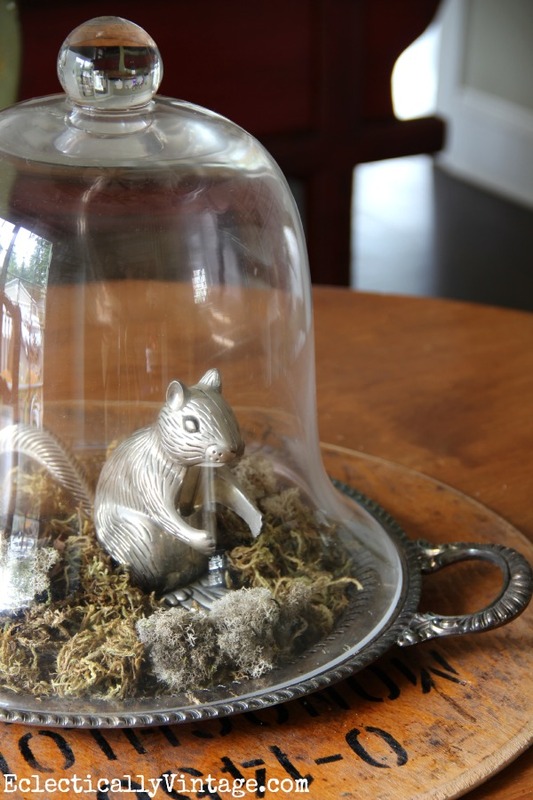 Who says terrariums are just for plants? 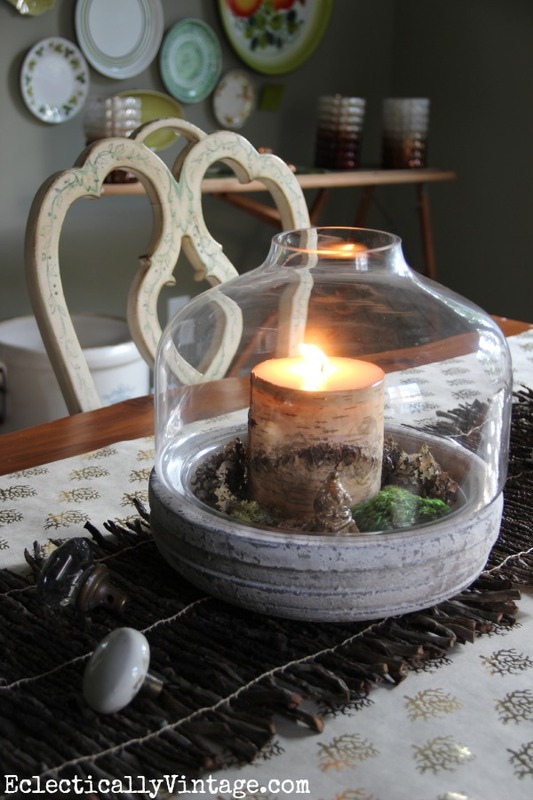 Layer some moss, a birch candle and a little gnome and it’s the perfect fall centerpiece. Don’t let the rush of activity and commotion stress you out this fall. 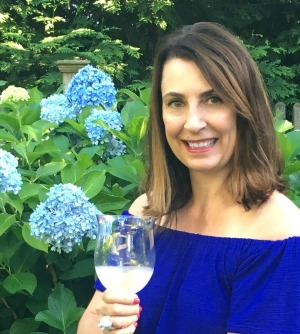 Do what I do, decorate then keep calm and drink lots of wine – cheers! Don’t forget to check out more of my fall home tour – you’ll never believe what I used for a fireplace screen! 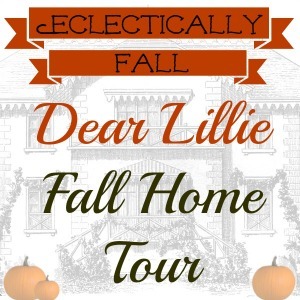 Next stop on the Eclectically Fall tour train is the amazing Dear Lillie. I’m on my way over for some spiked cider now! So many great World Market finds, as always I love your eclectic collections for every season. Beautiful!! wow, kelly! it looks amazing! 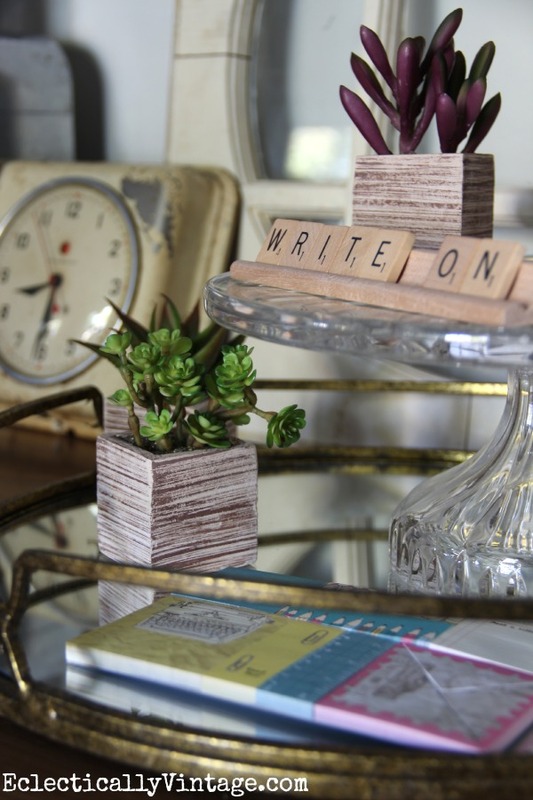 love all of your vintage touches and world market finds! 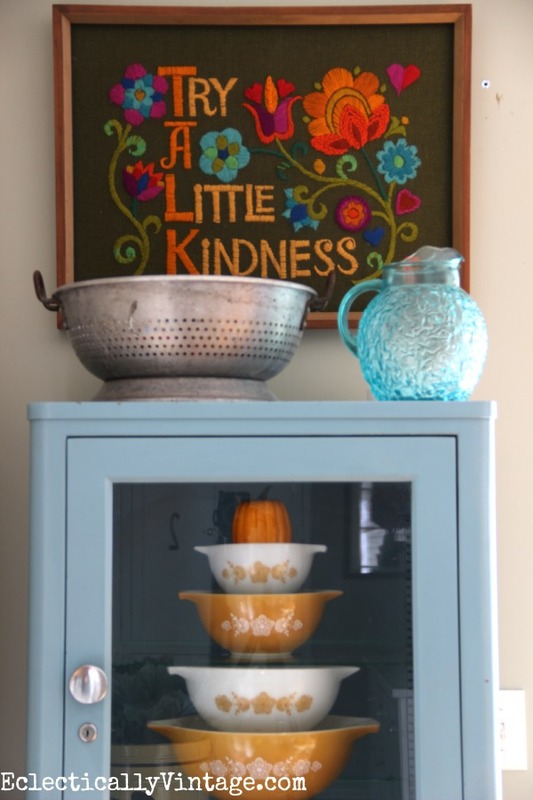 and i LOVE LOVE LOVE the try a little kindness- is that a vintage find? 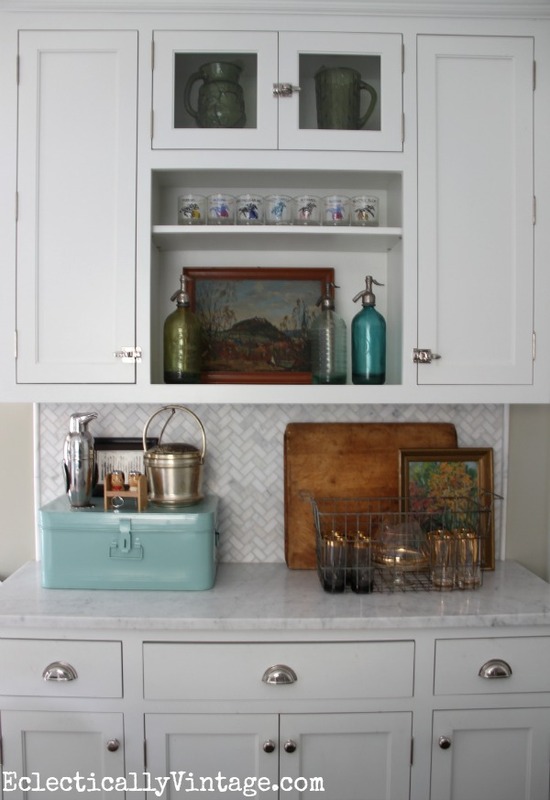 and what can i say about the medical cabinet, the gold shelf with green glass….. you know how to make my hear go pitter pat with prettiness! 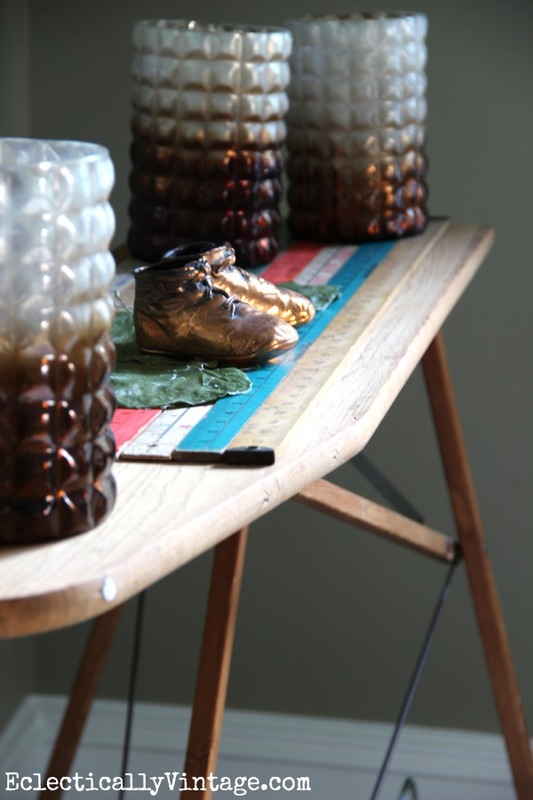 Thanks Cassie – yes the Try a Little Kindness is a thrift shop vintage find! 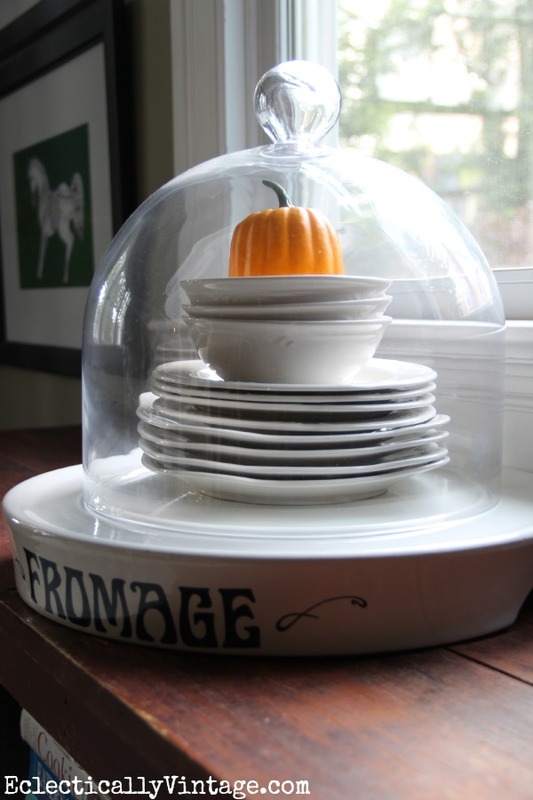 Love your fall decorating. I saw a million things I would love to copy, but I have a small apartment. However, I can always drink wine. lol. 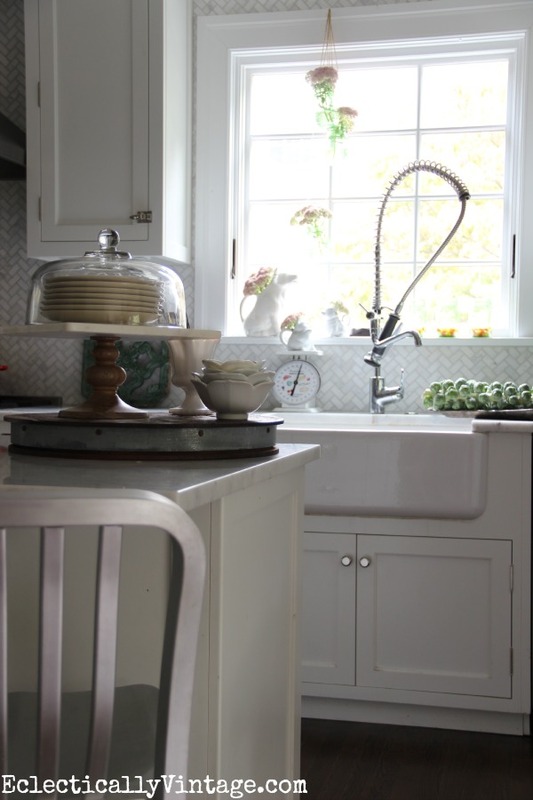 I am desperately searching for silver barstools just like the ones pictured above. Can you please tell me where you got those? Thank you! 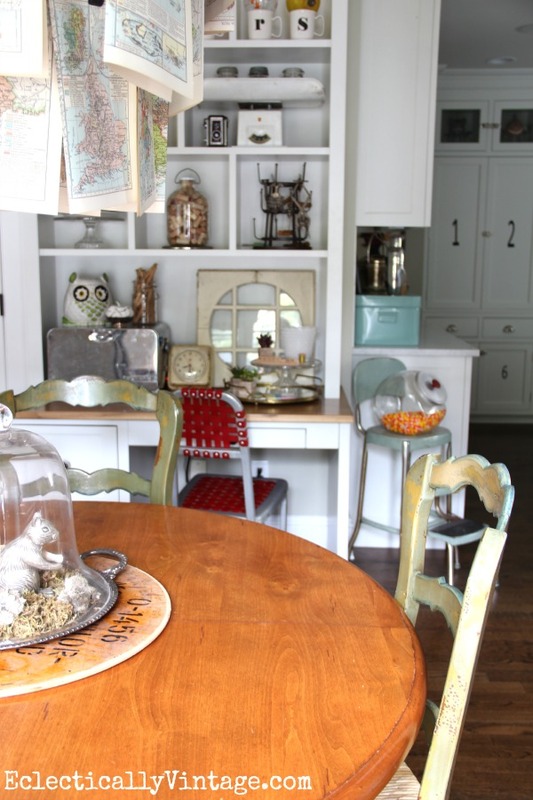 World Market and vintage fits so wonderfully in you GORGEOUS vintage home! I need about an hour to pour over all you fall beauty! 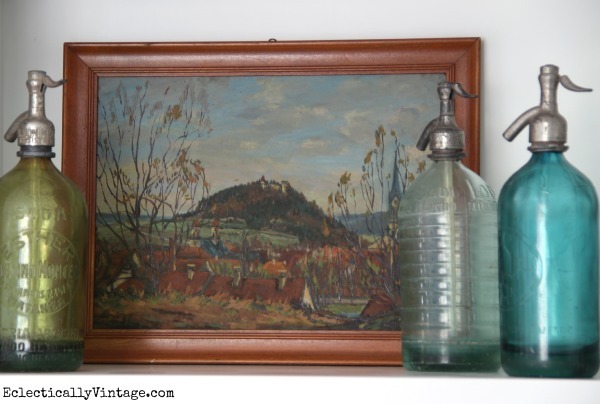 You have the most marvelous way of making vintage the star of your home!!! LOVE partying with you!!! hugs! Can’t wait for Fall. So many pretty ideas here! Love the green glass collection. Kelly, it all looks so amazing!! I love all of it, and I can see you put a LOT of work into your gorgeous Fall look!!! 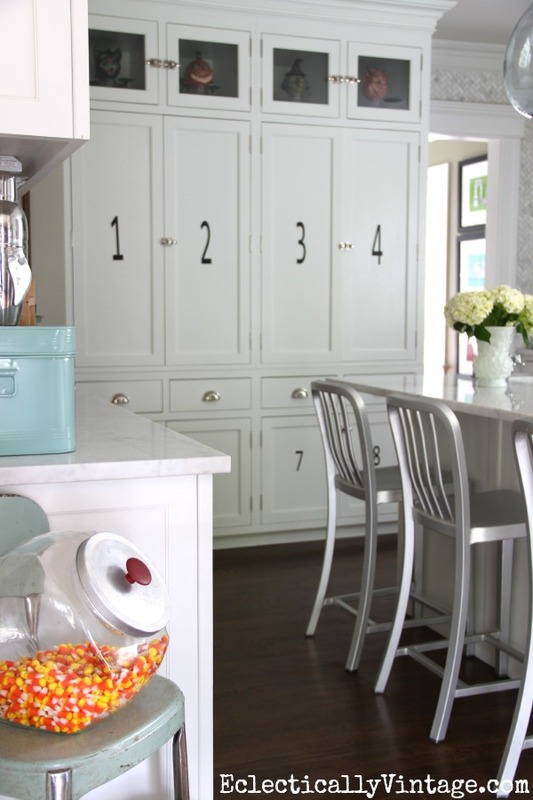 Beautiful Kelly, I have such a crush on your kitchen!!! Love all of your details! It looks lovely, Kelly! 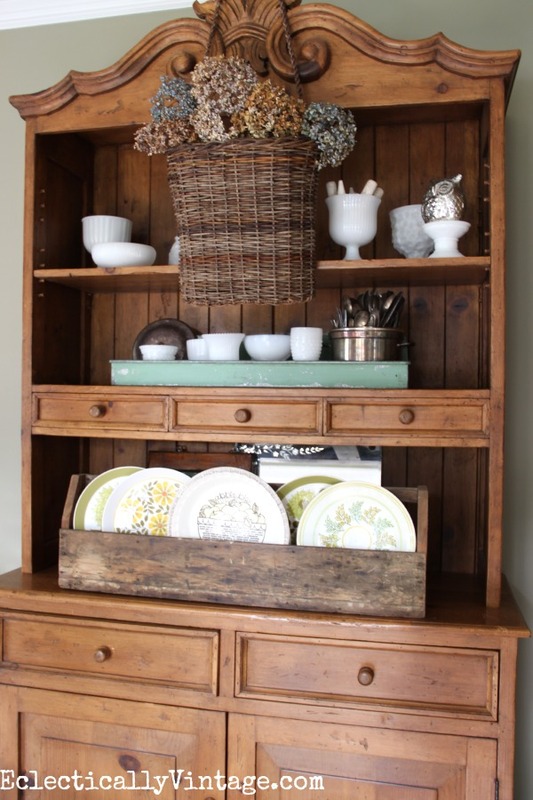 LOVE your hutch! Your World Market finds are wonderful – love everything you’ve done for fall. With the nip in the air today and your inspiration, I need to begin a little fall decorating myself! Happy Monday, Kelly! Wow! Everything looks beautiful! You have motivated me to get moving on my fall decorating! Completely charming! I have “fallen” in love with your home. Your home is one beautiful piece of eye candy! 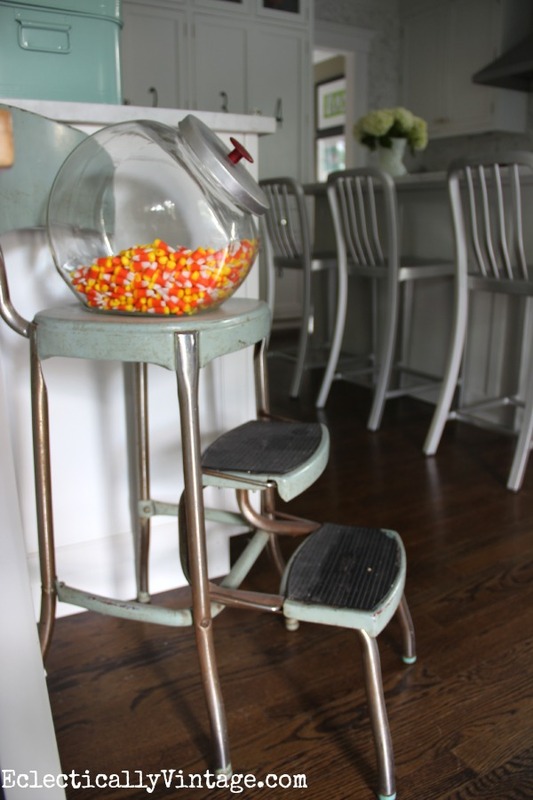 Wishing I had your candy corn canister to help me while away the time as I devour your pictures! I cook like crazy in here – on my red stove!! My island is perfect for prepping and serving at parties. It doesn’t always look this perfect – believe me – especially with 2 teen girls in the house! Absolutely fantastic Fall decor Kelly!! 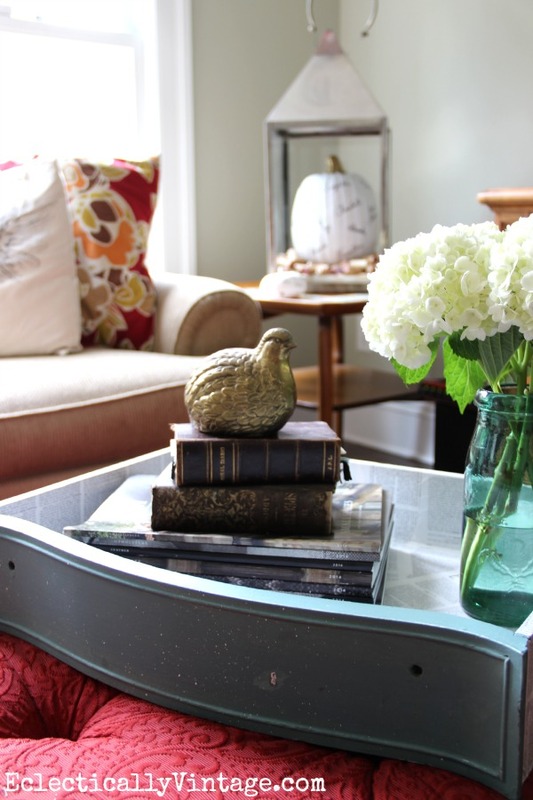 Your home is brimming with ideas as usual! 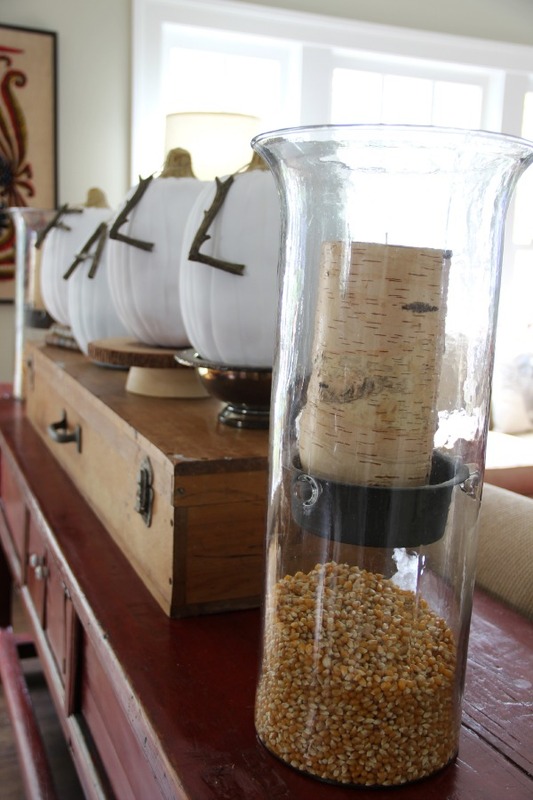 love everything in your home… fall decorating is awesome!! 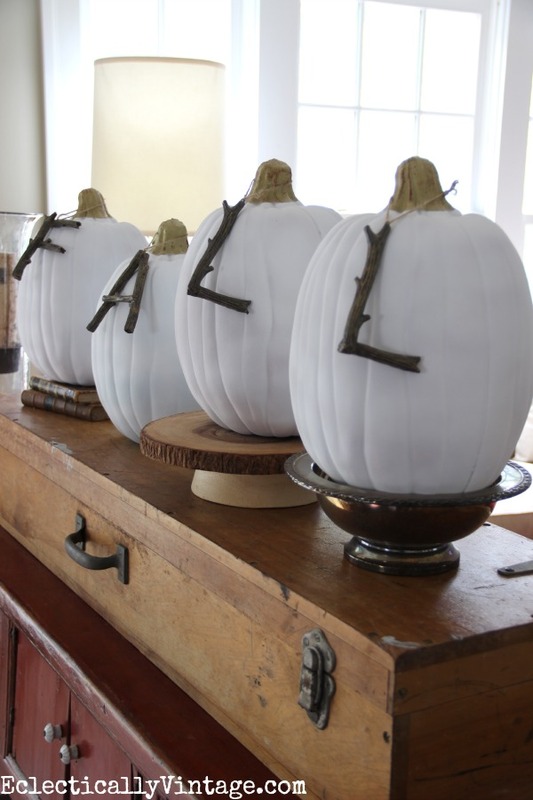 where did you find the “Fall” branch letters please.. love them!! Pure Fall awesomeness, Kelly! 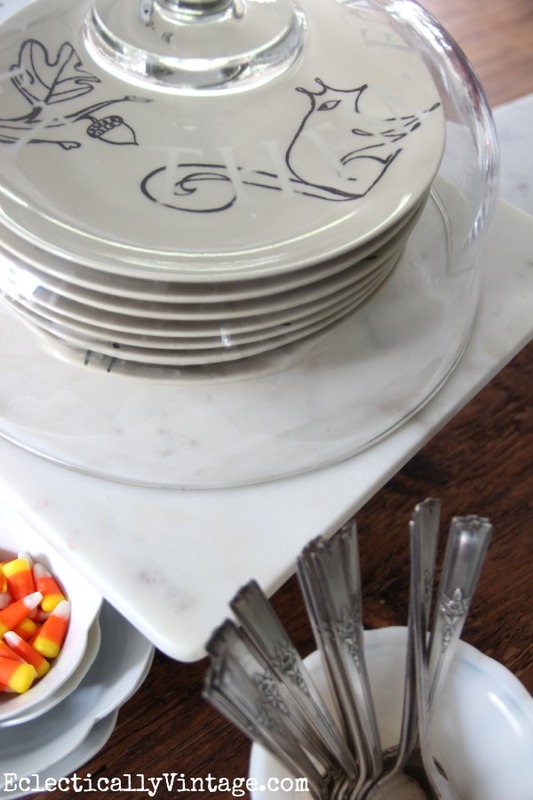 Your creativity was on overload this year … love all of it, especially the ironing table turned buffet (such a cool idea)! 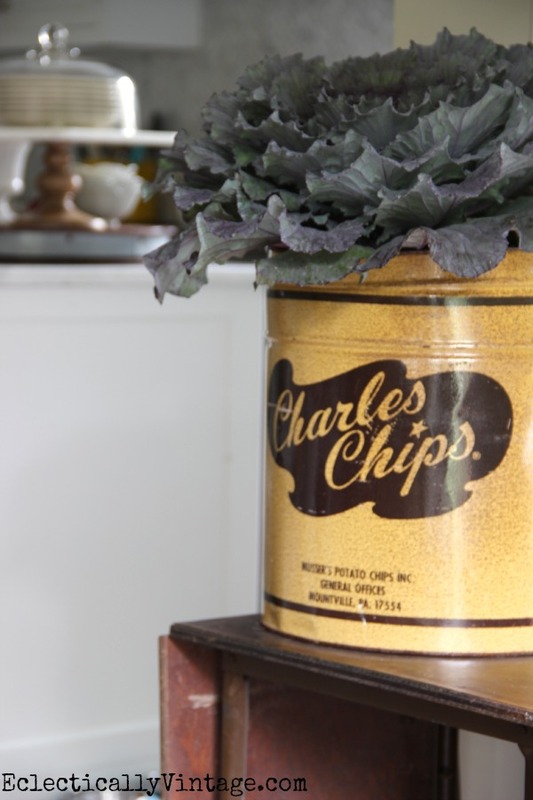 And, pretty sure I could still polish off a tin of those Charles chips in one sitting! 🙂 Happy Fall! Love your Fall decor,great job!!! As I meandered thru the photos I spotted several items I thought I might like to borrow. What do you think? Just for little while, like couple years or so. Love all your goodies Kelly. 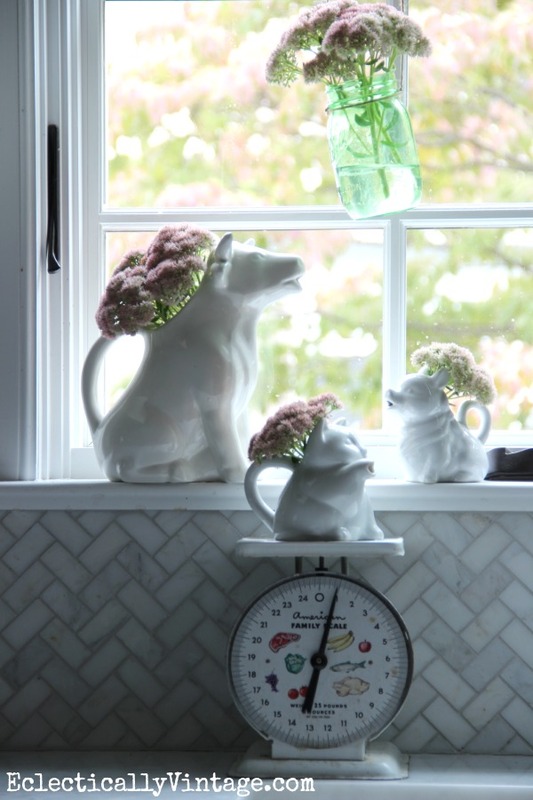 You have an incredible assortment of lovelies I’d sure be happy to put in our home. How you display them is very talented, just know how things should look together. 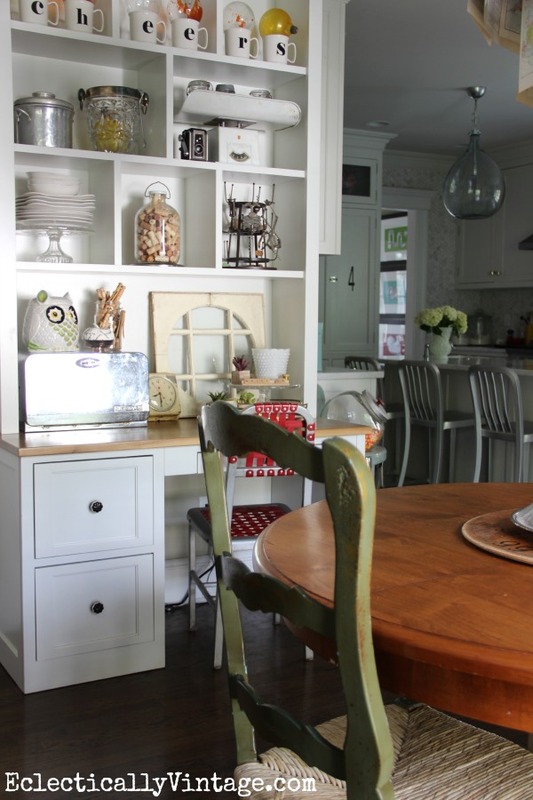 I always love touring your home for the seasons Kelly….your home is so beautifully and creatively decorated for the days of walking though crunchy leaves and the smells of a great cup of hot cider with cinnamon!! This is wonderful! 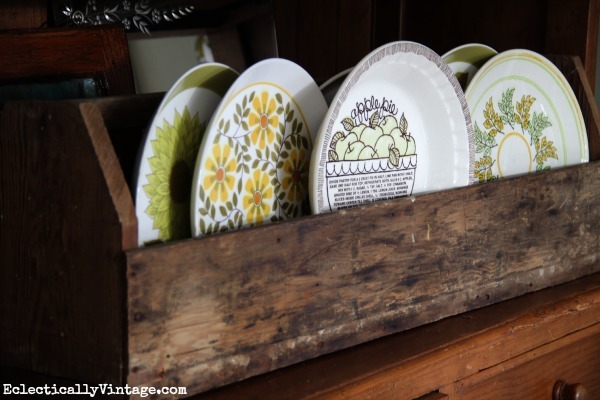 I am such a dish addict…that picture of the fall colored ones might be my favorite! 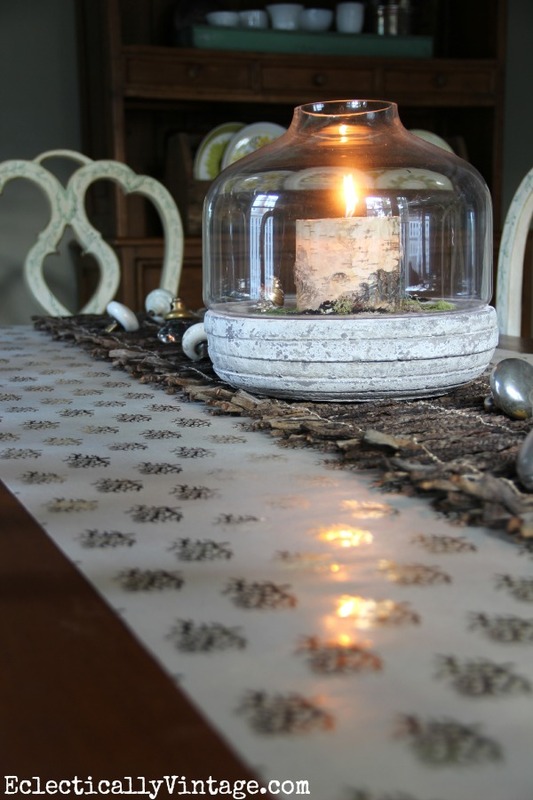 Vintage wrapped around Autumn… Lovely. Too many awesome things to comment on! I seriously just want to go shopping in your house. That blue cabinet is the find of the day. And I LOVE the embroidered sign. 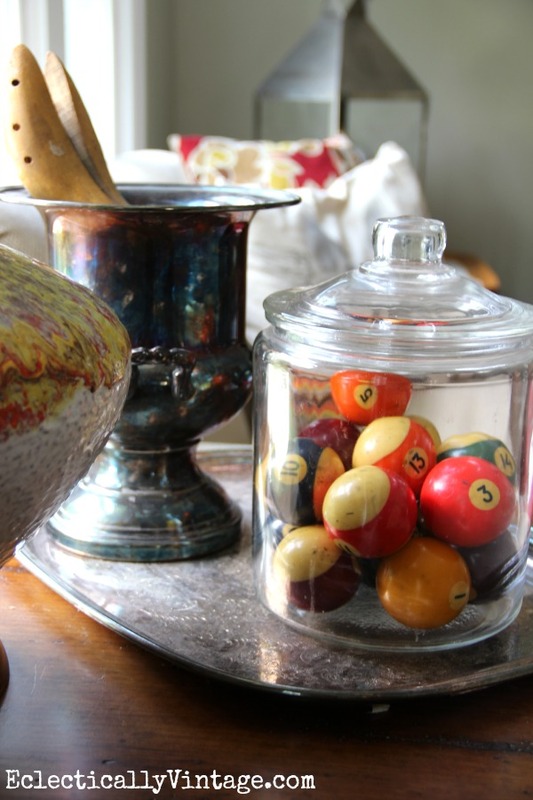 I love all the treasure in your beautiful home…pure eye candy! 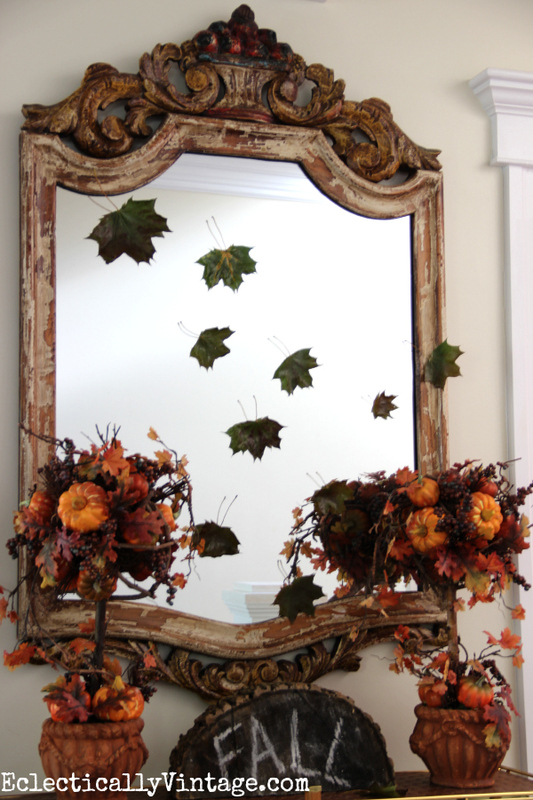 I especially love the falling leaves mirror for fall…wonderful!! Thank you for sharing! Everything is so so pretty! I love the hedge hog cups in your containers! And the brussels sprouts!!! I have never seen them on a stalk, where have I been living. They look pretty like that. Hi, loved the decorating. I loved your red comfy chair too, where did you get it? Who is on the tour today? After the last stop it said Stone Gable but no post is up today so I was wondering who else is today? Thanks for the tour of your lovely home. Tried stionegable but no direction to the next. Hope you can direct me to the next beautiful home. Stone Gable is tomorrow Linda – 3 homes per day all week long! Fabulous, every one is so doable and as a whole set the scene for a happy and cozy Fall! Thanks for all the natural beauty you have shared………….LOVE!!! Kelly I love your fall touches. 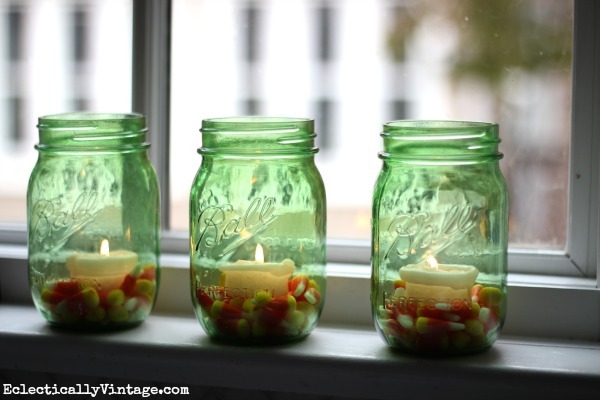 That jar of candy corn, my hubby would eat in a day, LOL. Just gorgeous, really. Started showing house. Such a fabulous tour, I loved it all!! 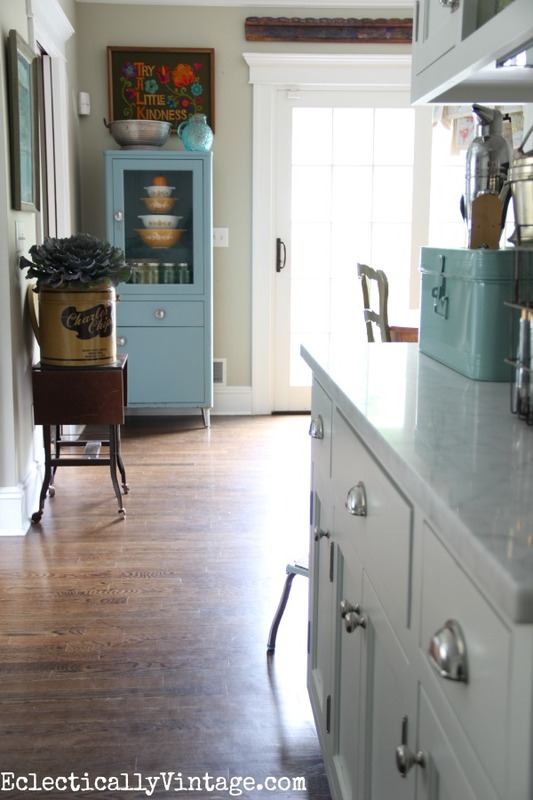 I have a question, where is the turquoise box on your kitchen counter from? I. cannot. believe. youhaveaCharleschipcan! OMG, I would love to get my hands on one! Great post. Your home is so beautiful. I love how classic your decor is. Not too themy, but just the right vibe. Love it all!! 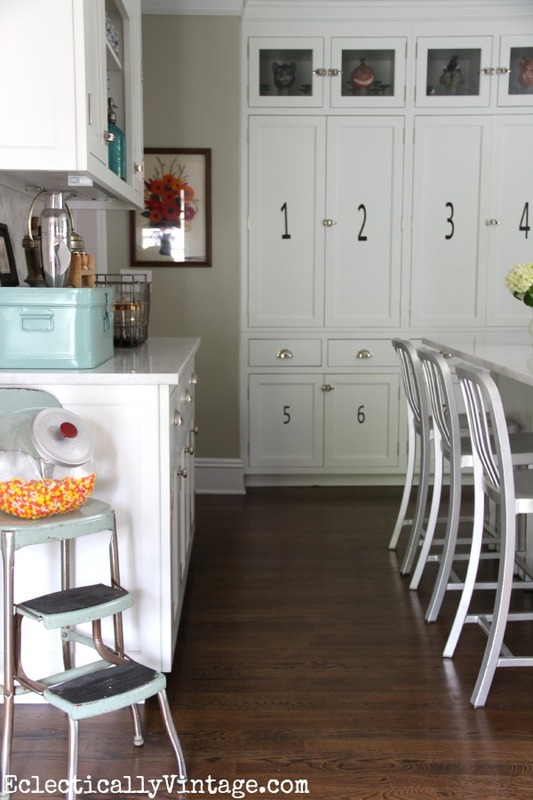 Your kitchen is awesome!!! Thank you for the fall tour. 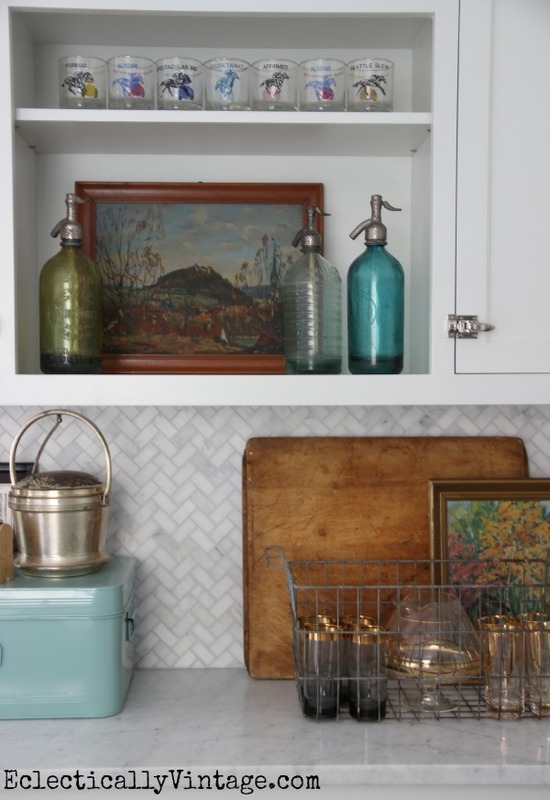 So many great ideas here, especially love how everyone displays and uses vintage. I am a kindred spirit and found so much inspiration. Oh my gosh Kelly! I see about a thousand things I would love to steal from your house! 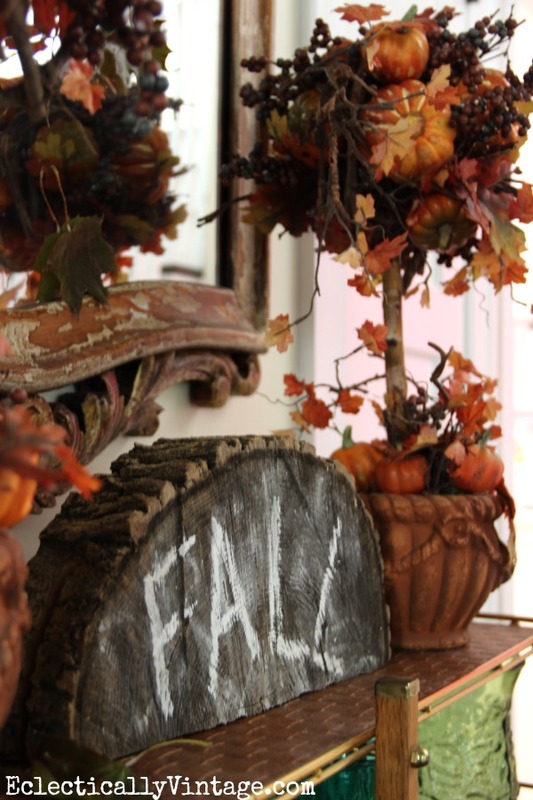 Love, love, love all of your fun Fall touches! Thank you so much for putting this fun home tour together! I would like to know where you bought the twig ornaments? 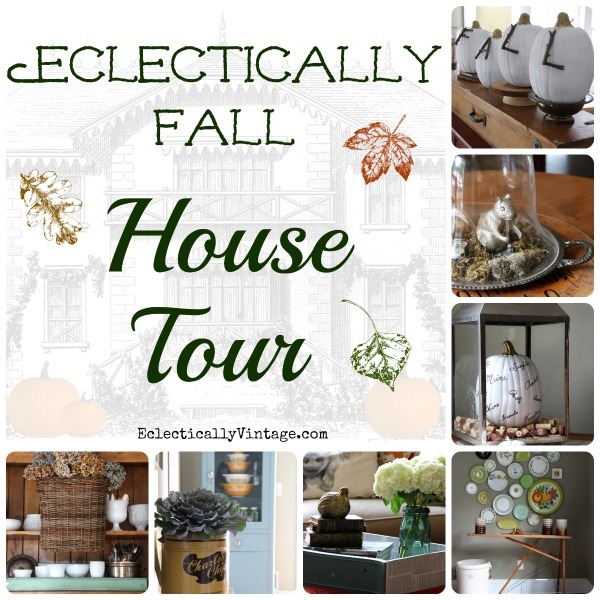 Kelly, your home is so true to your title, Eclectic! 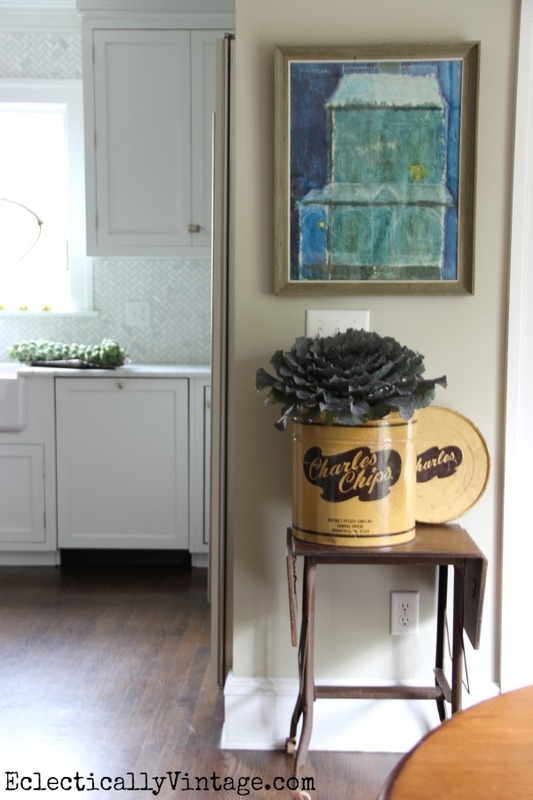 Love your style and choices for display…so inspired, can’t wait to see more! Thanks Taylor – here’s to being eclectic!